It's Feel Good Friday and you want to relax by playing a game on your phone. I get it. Today, instead of crushing candy, connecting dots or killing zombies with bok choy, may I suggest Free Rice? Free Rice is an online trivia game with a twist. As they explain, "For each answer you get right, we donate 10 grains of rice through the World Food Programme to help end hunger." Their goals are to "provide education to everyone for free" and to "help end world hunger by providing rice to hungry people for free." Topics include humanities, math, language learning, sciences, English, chemistry, geography and SAT prep. The categories can be challenging if you pick the right one and, thanks to the sponsors who advertise on the site, every correct answer translates to a donation of 10 grains of rice through the World Food Programme (WFP)! Want to learn more about the WFP so you can feel good about wasting time playing games? Of course you do. "The United Nations World Food Programme is the world's largest humanitarian agency on the front lines against hunger." (You can tell it's an international organization because the of the extra "me" in program.) As stated on their website, "The World Food Programme's mission is to save lives and livelihoods, and to improve the nutrition, food security and self-reliance of the world's poorest and most vulnerable people." Their work involves responding to emergencies, preventing hunger by distributing school meals and meals to people living with HIV and AIDS as well as promoting women's empowerment "as a key to improving food security for all." They work all around the world and in 2015, 76.7 million people in 81 countries were assisted directly by WFP. Of all these people, 82% were women and children. You can read more info from their year in review here or browse their collection of stories. They really are living up to their motto of "fighting hunger worldwide". To support the work of WFP, you can make a direct donation then stay in the loop by liking both the Free Rice Facebook page and the World Food Programme Facebook page. In addition, you can also follow both groups on Twitter @Freerice and @WFP respectively. 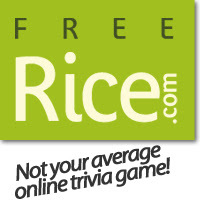 While I encourage you to do all of the above, I admit that the most fun way to fight hunger around the world is by going to Free Rice and answering trivia questions. You'll be surprised just how quickly you can put together a bowl of rice. Now get out there and rice up!